The occurrence of neck tension and headaches is often contributed to by the postural stress created from occupational hazards like sitting at a desk or in a car, or a generally sedentary lifestyle. In a seated position our shoulders often migrate forward, leaving some of the postural muscles in the back screaming for strength work to undo the trauma of being stressed and stretched like a rubber band! It is easy to target these muscles that directly influence tension-related headaches as well as improving posture (by pulling the shoulders back) and improving the tone of the back area. This exercise is designed to target the smaller muscle groups that are responsible for keeping the shoulder blades correctly positioned, i.e. flat against the back of the rib cage allowing for full range of motion. Start by lying on your front with your arms by your sides (with palms up towards the ceiling) and your forehead on the floor (see figure A). If you find it more comfortable you can place a small towel under the forehead but ensure that your neck remains in a neutral position with your chin tucked in for the duration of the exercise. Draw your tummy in (activate your abdominals), then lift the arms off the floor as you focus on squeezing your shoulder blades together and away from your neck. As you do this also rotate your hands outwards so your thumbs rotate out and up towards the ceiling. 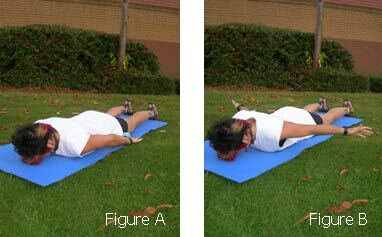 When you get to the furthest point of squeeze, hold for 1 second and try to feel the muscles between the shoulder blades working (see figure B). Make sure you do not allow your tummy muscles to relax or your shoulders to roll forwards which can happen if you focus on lifting the arms as opposed to the shoulder blades. This exercise is suprising difficult and therefore is susceptible to being abused by bad technique to make it easier. Ensure that the whole movement is slow and controlled and aim for up to 15 repetitions per set. This exercise focuses on training one side of the back at a time. By doing exercises that isolate one side/limb at a time you ensure that the body doesn't develop compensations where a dominant side/limb does the majority of the work. This kind of training helps to correct such common imbalances. For this you need a chair and an object you can hold in one hand i.e. a book, bucket of water, dumbell etc. 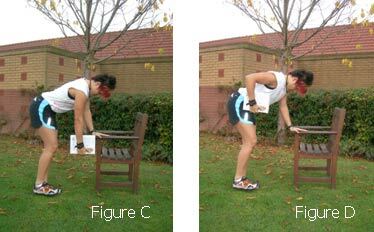 Stand as shown in Figure C with one hand on a chair placed in front of you and your knees bent. Keep your back straight and have the hand that is holding the object hanging down towards the floor. While keeping your abdominals tight throughout the movement, lead with the elbow up towards the ceiling and squeeze the shoulder blade towards the other shoulder blade (see Figure D). You are aiming to feel the muscles between the shoulder blades working to control the movement. Try to keep your chin tucked in and ensure your neck stays relaxed. Your shoulder should not start migrating towards your ear! Do two these exercises together as a program.